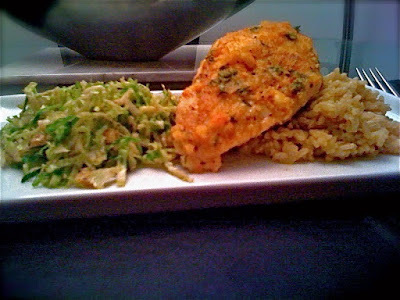 Orange glazed chicken with Shredded Brussels Sprouts and Autumn Brown Rice. First of all please allow me to apologize for the picture quality. My camera was dead when I went to take a picture, and we were far to hungry to wait for the battery to charge, so I used my iPhone. It’s not terrible, but it is not great either. Now… to the food!!! I originally wanted to try this dish with duck breast but it seems that, even at Whole Foods I can't find any duck breasts. I did find a rather large whole duck, but I didn't get it because it would obviously be too much! So I went for chicken breast. Since I was looking to have that fatty flavor that duck naturally gives out I chose to get the chicken breast (3 breasts) with skin on. I couldn’t find skin on without bones, so I had to debone the breasts at home. It’s really easy to do. You just guide your knife along the rib cage and you’re all set. So I wanted to make a quick V-Blog to show how easy to make pesto can be. I love all versions of pesto including cilantro pesto and arugula pesto. However tonight I want to show you the classic version! Basil! I hope you enjoy the video..